Use ClientLook’s top-rated mobile apps to take your commercial real estate business on the road. It’s the perfect compliment to our all-in-one commercial real estate CRM experience. 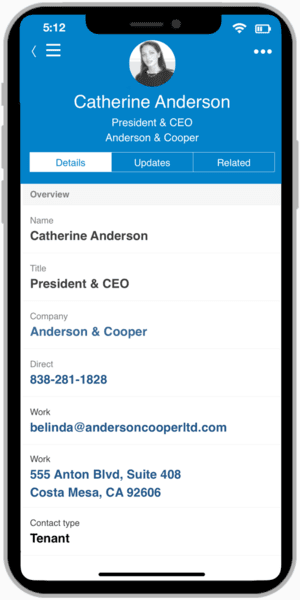 Build relationships faster with instant access to your entire contact database and the critical contact information you need everywhere. Work smarter and faster with seamless integrated workflows. The auto-dialer prompts you for the outcome of every call. Emails automatically attach to contacts. Amaze your prospects and clients. Before that next appointment, review the outcome of every past call and meeting along with linked emails and files. It’s all here. One simple page helps you understand the relationships a contact has with properties, deals, groups and more. Also see pending activities company-wide. Build your own proprietary property database. Access that intelligence anytime, anywhere to accelerate deal making. View every property detail you track in a simple and accessible way. See property attributes, improvements, finances and even custom fields. Drill down to related availability, comps, ownership, tenants and more. View live research from integrated subscription services. Make changes on the fly. Organize every deal-related activity, email, file and more in one place. Manage pipeline and collaborate in real-time with clients. Manage daily tasks and long term follow ups. Nothing falls through the cracks as you scale your business. Always know where you’re supposed to be with daily, weekly and monthly calendar management integrated with contacts, properties and deals. Our real-time activity feed called Scoop is a lifeline to your business. See every update, completed activity, email and more in this company-wide utility.